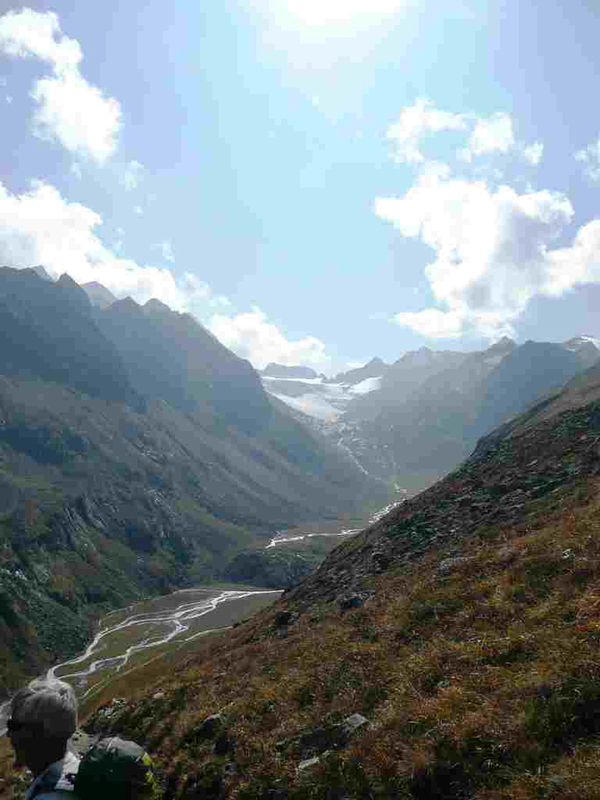 This magnificent trek follows a horseshoe of excellent huts in the Austrian Tyrol's beautiful Stubai Alps. It does, however, involves a lot of serious glacier walking. Caution! Superb views of snowy peaks, mountain lakes, shimmering glaciers and typical Alpine meadows massed with flowers. This marvellous high hutted walk follows a horseshoe-shaped circuit along the mountains which now straddle the border between Austria and Italy. It usually takes 6 or 7 days, with between 5-8 hours of walking each full day (5-15km); it varies in difficulty, with some hard, high days to tackle. It leads from hut to hut though a wide spectrum of landscapes from flower-strewn grassy slopes to narrow snow-covered ledges. This route crosses several glaciers, so you need considerable experience unless you have a guide – and all the right kit. It is not for beginners. The scenery is spectacular and varied, from vast craggy peaks and high glaciers to lakes, valleys and meadows of tiny alpine flowers, with far reaching views from the Swiss Alps to the Dolomites. The path takes you up through the steep lower landscape of pine forests to the (relatively) gentler pastureland above, classic alpine scenery complete with grazing animals, traditional farming methods and verdant meadows, decorated by a profusion of wild flowers and streams. As the route reaches higher altitudes the green gives way to harsher mountain scenery. The rocky tracks cross boulder fields and can climb steeply over slippery shale and loose stone, but afford magnificent views of the high peaks and glaciers and over ridges towards the receding range, or down onto turquoise alpine lakes. Here the most strenuous parts of the walk negotiate narrow, steep ledges and cross the formidable beauty of vast (albeit tragically shrinking) blue (sometimes dirty) glaciers, a serious undertaking. You will need proper equipment and good experience (or an experienced guide). This is demanding walking in remote mountains with uncertain weather. Come fully prepared. An early start each day is advised to allow you to complete the majority of the day’s walking before midday. The sun can be but the possibility of a sudden snowstorm should not be discounted at any time. The route is marked by cairns, with cables at the steepest parts. A variety of wildlife can be seen, including loveable marmots, chamois, ibex and various raptors and vultures. There are welcoming huts on route. Accommodation is generally either in dormitories or twin rooms, and food is plentiful and good. The huts provide a welcome place to relax and meet other walkers, and to plan the next day’s journey. See our Stubai Alps page for more information on the area and photos. Really great walk which can be done in fewer days than the classical 8. Not to technical, yet some ladders and somewhat difficult passages.